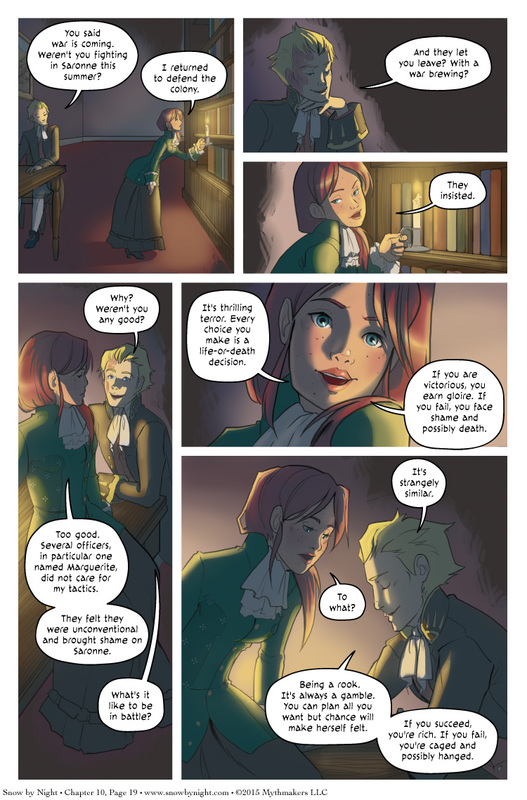 On Chapter 10, Page 19, Vivienne explains why she returned to Aradie even with a war brewing. It seems that once again Marguerite has set back Vivienne’s military career. You can read about the first time Marguerite did this in Losing by Winning. To see how Julie sketched out the next page (complete with her color commentary), please vote for Snow by Night on Top Web Comics. I’m happy to announce that we will be starting our Kickstarter campaign for printing Volume 2 this Wednesday, March 11. The preview of the campaign is now available! Steph did an amazing job putting together the video and the graphics. The Kickstarter page lists all the rewards available, lists how the money is going to be spent, and gives a short introductions to all the people who contributed to this volume. Please check it out! Explosions Vs. Chimera Eating everyone. Yay explosions. Panel 5 extra ‘are’ in there? Yes, there is. Good eye. Fixing now. Heh, Vivienne might not find the comparison very flattering, but I think it sounds pretty accurate.